I just started using Waterfox about 3 weeks ago. Does anyone else here use it too? And if so, why are you? For general information. Why every time anyone see a different browser they are compelled to try and use it. Do as you wish. however maybe a good search first would answer your questions. howToGeek is a pretty reliable site for general information. Maybe people here I know check it at times for info. Maybe you should also because if anyone here checks this browser for info I doubt you will gat any from here. Just saying. 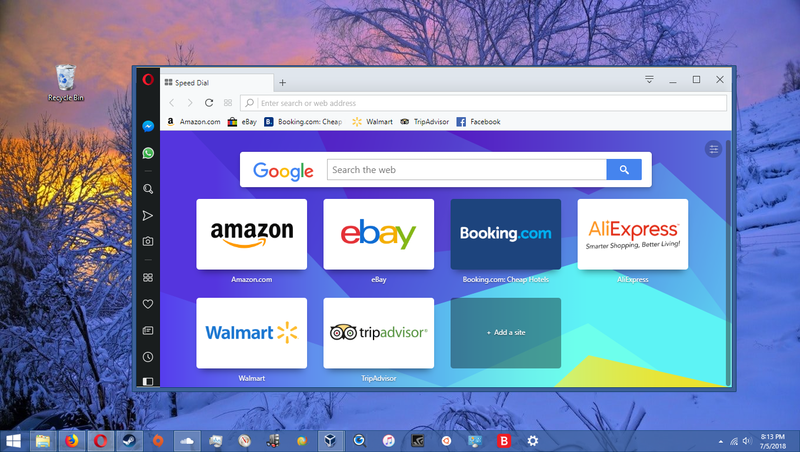 I tried FireFox, Chrome and a few others until finally settling on Opera. Both FF and Chrome would freeze from time to time. After getting Opera I don't have that problem anymore. Opera is now my default browser even though WB doesn't skin it. Opera is now my default browser even though WB doesn't skin it. Been using Opera for years now. Mine does skin the top bar. The bar with the min, max, close buttons. Even skins the buttons. Better then nothing for sure. 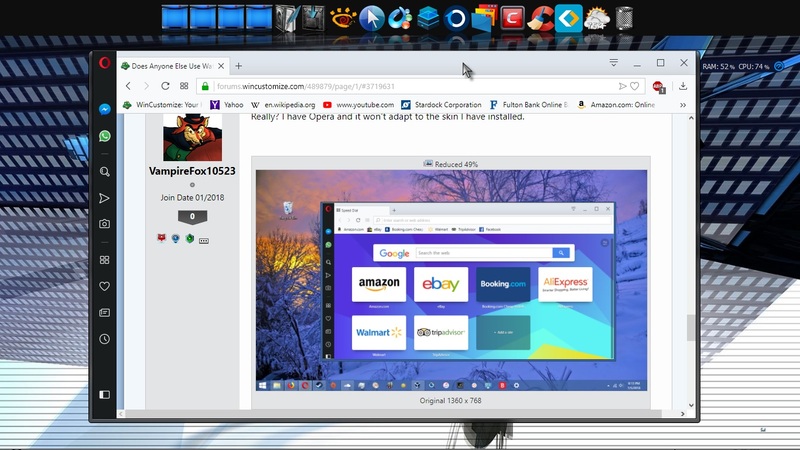 I've been using Opera for a very long time now, and to be honest, I have never had a problem with it skinning in Windowblinds. All my web pages skin completely with no problems, which is why I abandoned Chrome in the first place. 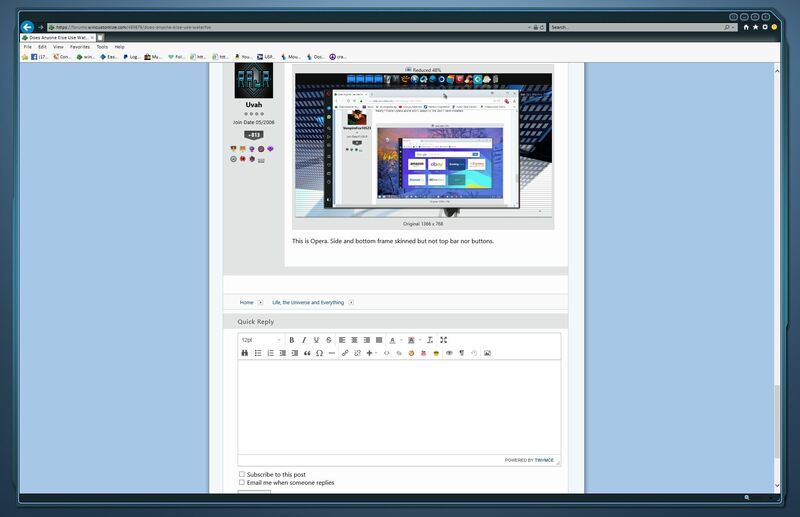 I had abandoned Firefox for PaleMoon some time ago, after Firefox got way too bloated and slow for me. After reading the above posted link, I upgraded Firefox to the 64 bit Quantum version, and I have to say it is much snappier. I had to spend an hour trying to get it to look acceptable to me, though, and I still can't get the tabs placed where I want them, but it is rendering some pages that PaleMoon wouldn't. Well, I will always use Chrome. I love it when I can sign in with my account on any PC on Chrome, and all my settings and bookmarks import automatically. Any changes I make on one PC automatically update on my others. I tried Waterfox for a couple of days but found it wasn't rendering pages of sites I regularly visit with Firefox without issue. Not only that, the 64 bit version was clunky and sometimes wouldn't open pages at all. In the end I decided that Waterfox was too much trouble and went back to Firefox and Opera. I use Chrome also. In fact I can't use Opera to do my banking as my bank doesn't recognize it but does Chrome. I do use Opera for most things however. As I said many time. The best browser is the one that works best for the person. Reason I posted here was with anything I do research and the browser mentioned above does not have any good reports except maybe for the maker of the browser. Really? I have Opera and it won't adapt to the skin I have installed. I certainly found it to be clunky, unreliable and picky about what pages/sites it would render. Its code is supposed to be based on Firefox code, but it does not behave anything like Firefox. I've never had rendering issues with Firefox. Another issue I had Waterfox was being unable to sign into my Deviantart account. Whenever I tried I got a message from Devart saying that my password was incorrect... yet I could sign in with it using Firefox and Opera. And yes, I did check to see if it was entered correctly in Waterfox.... several times, in fact. It was, and I could sign into Wincustomize ok using my credentials, just not into Deviantart. This is Opera. Side and bottom frame skinned but not top bar nor buttons. opera skinned Frames skinned. I only tried 4 of my windowblinds but it changed with each of them. Not quite as much as IE but I'm happy with it. Then how come it don't skin mine. Not fair. I don't know Ross but you see my SS. Yup. I seed it alright. What Opera version do you have? My Opera looks like Uvah's. Side and bottom are skinned, but that's all. Ther is one latest version I didn't update to. Not much change the last 2 numbers instead of .46 are .52. If you have an older version you may want to think about updating. I used the 64 bit version of Waterfox for a while when Firefox still didn't have a 64 bit version (I keep a lot of tabs open and the 32 bit version of Firefox would quickly hit the 2 GB limit of 32 bit applications). Went back to Firefox when the 64 bit version was released as it solved the running out of memory problem (Mozilla is constantly on top of security updates, etc, so my guess is that it is much safer than Waterfox, but feel free to correct me if I am wrong) but it created another issue: memory fragmentation. Eventually memory would become so fragmented that Firefox 64 bit would become slow as molasses. Opening the About:Performance page (IIRC) and compacting memory fixed the issue for a little while, but the slowness would eventually come back, so it was a bit of a PITA. Considered switching to Chrome for a while, but then the Quantum version of Firefox was released and I have been happy ever since. Of course, Firefox 64 bit will STILL swallow up all your RAM if you let it, but at least now it remains snappy while doing so. As regards page rendering, Brave has been by far the best I've used, flawlessly rendering every page I ever visited and very fast. Its Achilles heel, and the only reason I don't use it as my daily driver, is it doesn't handle PDF rendering internally well and breaks my daily workflow which involves viewing & editing PDF's regularly. That's based on its version from 6-8 months ago at which time it wouldn't accept the Adobe PDF plugin, so things might have changed. Since it had been a while, I decided to take the current version of Brave for another spin. Remains lightning fast, very noticeably faster than FFQ and Opera. Far and away the best at rendering & sizing window content of all the sites I regularly visit/use, and I mean flawlessly, with one ironic exception: JU - the Quick Reply dialog will simply not appear (I'm back on Opera for this, obviously) despite lots of hunting around in settings for something that might let it show up. The other really strange thing, which I would have thought was part of 'Browser 101', damn near code line 1, is that it won't remember its window position & size on close - it always opens at a fixed size in the center of the screen no matter where & what size you left it. I don't remember that being the case when I tried it before. Really a shame those nagging defects remain or it would be the slam dunk best daily driver. The thing that had previously been the showstopper for me, on the other hand, appears to be fixed: it now handles PDF's in the browser just fine. Go figure. LastPass integration is seamless now, as well.